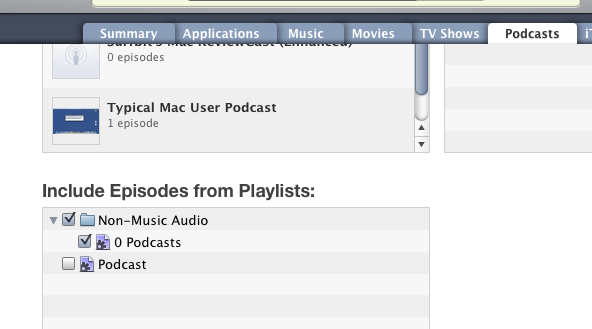 I haven't had a chance to figure out what's going on, but iTunes 9 doesn't play nice with playlists with podcasts. I have a playlist that I use to mix podcasts and music (though just now it's all podcasts, I think), and iTunes 9 segregated that playlist under podcasts. Very uncool. Okay, I've work to do, and I won't be able to take my iPod with me because it's now reloading my podcasts (including the MacCast). So, for now at least, I HATE iTunes 9. I encountered something very similar on my older 160 GB iPod Classic. I have a smart playlist set up for all my new podcasts so that I can listen to them in release date order across all titles. When you posted this thread I checked my iPod and ( which I had just synced last night in iTunes 9 ) and found that, similar to your case, there were no podcasts showing in that playlist. I found that the solution in my case was to connect the iPod, go into sync settings under the podcast heading, and instead of setting to sync all podcasts I changed it to sync selected podcasts, making sure that the playlists were all selected also. I was able to solve it by going to podcasts, and the list with the podcasts in it showed up there, so I set it to sync, but now if I add non-podcasts to the list, I'll have to select it on the music side. I think '"improved"' is how it has to be said. What were they thinking? That's just it, developers, whether at Apple or any other software development company can never think of every conceivable way a user will interact with the product and sometimes things like this happen ... they get so wrapped up in making sure it works the way they use it that sometimes these things get missed. Back in the day ( early 80's ) we had a term for it ... "Pilot Error" .... it doesn't mean the user has done something wrong, just something that never occurred to the programmer anyone would do or try.